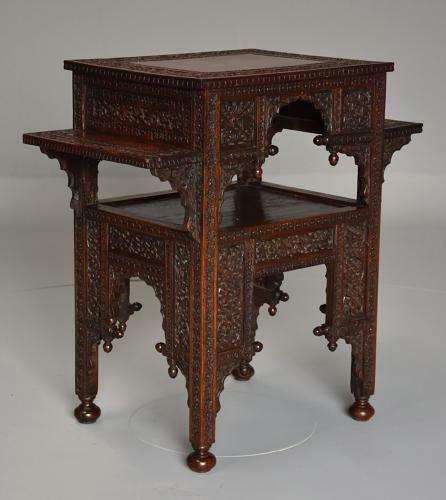 A late 19th century Anglo Indian padouk two tier freestanding occasional table. This table consists of a rectangular top with carved floral border leading onto a wider frieze profusely carved with foliate decoration. This leads down to a carved shelf to either side with brackets and an arched pierced and carved floral and foliate frieze with open shelf below. This leads down to profusely carved and pierced floral and foliate panels with carved legs terminating with turned feet.